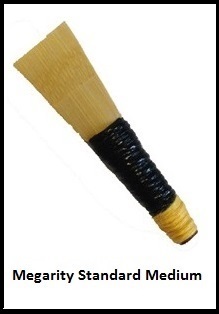 Megarity Pipe Reeds - this ridge cut style reed is made by long-time reed maker, Stephen Megarity. The reed is very free and responds well to moisture. The reed comes is available in soft, medium, and strong strengths. Stephen Megarity has played with such bands as Field Marshal Montgomery, Boghall & Bathgate Caledonia, LA Scots & Glasgow pipes & drums. He Started his reed making at Warnock reedmakers in Northern Ireland, over 20 years ago. Megarity reeds are proven, consistent, and available in the most popular range of strengths. They have a shoulder-cut design and are especially well suited to band use. Originally from Northern Ireland, reedmaker Stephen Megarity's piping experience spans across the UK and North America. He works with bands to improve their sound and performance and brings that expertise to his reed-making. Megarity reeds are made in the U.S.A.
You never see a professional player struggling to play the bagpipe; they always seem relaxed and comfortable. The pipe bag is the correct size, is 100% airtight, stocks are tied in correctly and have no cracks, the blowpipe is the correct fit, the valve is functioning properly and all the joints are hemped correctly (see the past 3 articles). If you have corrected these problems and the pipe is still difficult to play the next thing to address is the pipe chanter reed . Many pipers get into the bad habit of trying to blow reeds that are much too strong for them. Nothing can hamper your technique and expression more than trying to play a bagpipe reed that is too hard for you. Pipe bands are one of the biggest contributors to this problem by insisting that reeds must be stiff and difficult to blow in order to contribute to the sound of the band, don't get suckered into this myth. It is not the goal of this article to teach pipe chanter reed adjustment, (that will come later) but rather to help in your selection of a reed that is within your playing comfort level. The question I am asked the most is "What strength reed should I play easy, medium, strong or something in between"? The answer is none of the above, you have to play a reed that is within your own personal comfort level. What may be a strong reed for one person might be a medium reed for another person. 1. The reed should have a nice clean look with no splits down the length of the cane and no chipped corners. 2. Both reed blades should be the same thickness and must fit tight together with no gaps. 3. The blades at the open end should have a nice elliptical shape. Hold the reed in one hand and place a finger over the cane tip's end of the reed to seal it and blow through the reed from the staple end, run a finger of your other hand down both sides of the reed to ensure that no air is leaking from the blades. If the reed is leaking air discard it. Now place the reed of your choice into the reed seat of the pipe chanter and take a deep breath. Form a tight seal with your lips around the lacquered hemp on the pipe chanter reed (not over the hemped end of the pipe chanter) and play the scale from Low A to High A and then back down to Low A. If you can't do this in one breath - the reed is too strong for you to play comfortably, select another reed. When you find a reed that will pass this test, that is the correct strength reed for you in your present playing condition. By following these three steps you should be able to select a reed that will give you many hours of comfortable playing.